Monster Hunter fan? Enjoy art? Capcom has announced The Gathering Hall, a new feature at the Lazarides Gallery in London. Open from noon on July 3rd until September 1st, anyone toting a PSP and a copy of Monster Hunter Freedom Unite can enter The Gathering Hall for free. Free sodas and exclusive PSP content will be offered (presumably via wireless connection) within the gallery's three floors dedicated to the exhibit. It will be open from 10:00 AM until 8:00 PM (local time, of course) all seven days of the week. Players should have no problem finding ad hoc co-op buddies in here! 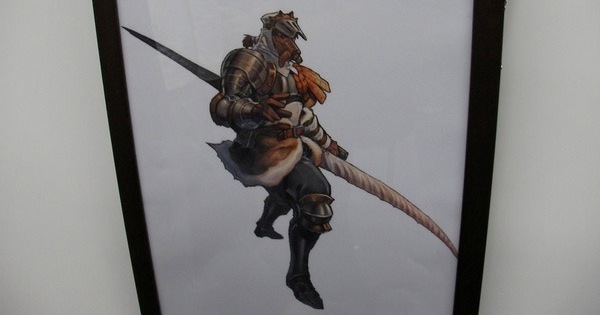 You can see the press release below, and after that, an extremely cool piece of official Monster Hunter art. London, England – Capcom®, a leading worldwide developer and publisher of videogames, can today announce the exciting news that The Gathering Hall, the UK’s first and only dedicated Monster Hunter gaming centre, will be open to the public from 3rd July. Monster Hunter is the biggest game in Japan by far, outselling Pokemon and Wii Fit last year. Home to over three million players, Japan has seen the growth of a new kind of social gaming in recent years as this PSP game has won over the hearts of gamers across the country. Players can be found in most tube compartments, in many cafes and fast food restaurants, and even just congregating on street corners. Festivals have been held in all the major cities attracting thousands of players and Monster Hunter package holidays are also popular. Only a stone’s throw away from Tottenham Court Road tube station in central London the Gathering Hall will be the ultimate destination for Monster Hunters. Aiming to recreate the social gaming environment enjoyed by Monster Hunters from the east, people will be able to meet other players easily, download exclusive quests, learn how to play on dedicated tutorial nights and meet the developers when they visit the UK. The Gathering Hall will be open seven days a week and entrance will be free and exclusive to anyone with a PSP and copy of Monster Hunter Freedom Unite. Monster Hunter Freedom Unite is available exclusively for PSP from 26th June. The Gathering Hall, situated at 121 Charing Cross Road, will open on Friday 3rd July at 12pm. For more information about the game or the Gathering Hall itself, please contact Leo Tan (leo.tan@capcomeuro.com). Capcom is a leading worldwide developer, publisher and distributor of interactive entertainment for game consoles, PCs, handheld and wireless devices. Founded in 1983, the company has created hundreds of games, including best-selling franchises Resident Evil, Street Fighter, Mega Man and Devil May Cry. Capcom maintains operations in the U.S., U.K., Germany, France, Tokyo and Hong Kong, with corporate headquarters located in Osaka, Japan. More information about Capcom can be found on the company web site, www.capcom.com. The following image was released by Capcom, and serves as a chart to compare the sizes of all of Monster Hunter's beasts, Zoobooks style! The full-resolution image can be viewed here, courtesy of Kotaku.